Want to add a streak of adventure to your Zion National Park trip at no cost? If your answer is “Yes” (why wouldn’t it be? ), then dispersed camping is the way to do it. 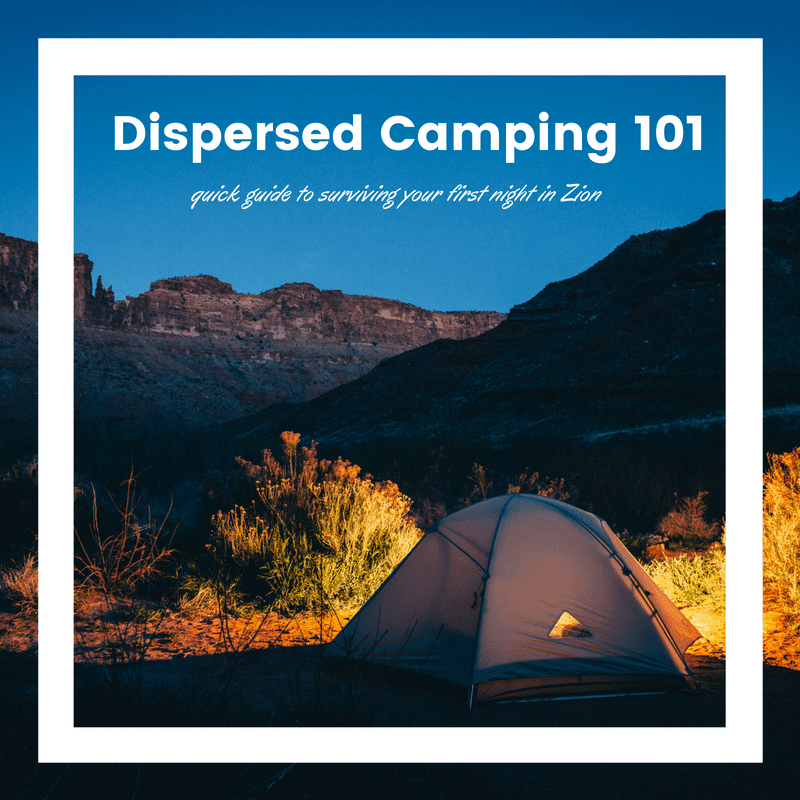 Dispersed camping, also known as “free camping”, “primitive camping”, “wild camping”, “dry camping”, or “boondocking”. This method is my personal favorite way of spending the evening beneath the stars. Avoiding the crowds, enjoying the added thrill of discovering your own site, and being alone in the wild is an enchanting endeavor everyone should experience. Needless to say, The Watchman Campground and The South Campground are sensational, but it is a more simulated and controlled experience. Modern campsites have all the accommodations you would find at most high-end lodging sites, including wifi! With growing crowds, increased prices and commercialism, established campsites can seem underwhelming to most outdoor purists. What are some attributes of dispersed camping, you ask? Dispersed camping is synonymous with no services. No toilets, no trash pick-up, no fire-pits, no facilities, no camp supervisor, and certainly no wifi. Zilch, nada, none! All of the supplies you may need for the evening are brought in and taken out at the end of your adventure. Implied in this is the added responsibility to the camper, but removing the screen between you and raw nature makes it completely worth it! Naturally, having no services also means that there is no cost to the camper, and who doesn’t like FREE? Set up camp during the day. It’s inadvisable to wait until the last minute to set up your camp. If you have an action-packed day plan, it is recommended that you secure your site first- thing. It can’t be stated enough just how inconvenient finding a suitable site and setting it up appropriately is in the dark. Water! Bring more than you think you need. You want at least 3 gallons of potable drinking water per person per day, especially here in the desert. You also need water for cooking, dishes, bathing, and to put out your fire before bed or before leaving. Strategize for proper waste management. Again, 99% of the time you will not have a bathroom so some extra planning is going to be needed here. Bring biodegradable wipes or toilet paper, a shovel (dig at least 6 inches down), or bags to dispose of waste if digging isn’t your preferred method. Some campers bring out old ammo cans purchased at Army/Navy stores to store their full waste bags. Bring biodegradable soap. For washing yourself or cleaning your cookware, you’ll want to have a soap that is eco-friendly. Campsuds, Sea-to-Summit Wilderness Wash, or Dr. Bronner’s Castille Soap are all great options. Be sure to pour out soap water into the soil at least 200 feet from any water source. Do not dump used water into any streams, rivers, or lakes…*Ahem*, we are in Utah: I mean “reservoirs”. Bring your own firewood. Implied in the “leave no trace” pledge is to leave nature the way you found it. Knocking down branches and small trees to use as firewood is not appropriate. Dead debris on the ground acceptable, but you’ll also want to purchase logs before-hand to keep with you. Check with your nearest park services or visitors’ center to see if there are any fire restrictions. Don’t be the person who starts a wildfire. Just in case you’ve been “that guy” in the past, here’s a useful breakdown of what to avoid. Do not cut, break, or disturb any trees, bushes, branches, shrubbery, or any other living thing out in the wild. You want to have as little of an impact as possible during your stay. Do not take anything! This means you need to return that bag full of pretty igneous sedimentary rocks. Respect other campers nearby. Everyone loves a good campfire party, but if you’re within a few hundred feet of any other campers, please be respectful of quiet hours. Most campers are trying to wake up early to avoid the heat, so late-night raving is not usually in the itinerary. Don’t assume the fire is out! Before you leave your campsite, be sure to put out your fire completely. Use water to put out the initial fire, then mix the embers and ashes with soil or sand. After stirring everything around, check with your hand. If it’s too hot to touch, then it’s too hot to leave. town of Virgin. A breathtaking 21 miles of BLM land (some private land as well, so be sure to look for signs), is a camper’s dream. One insider tip is to drive all the way to Kolob Reservoir to camp water-side; it’s also rumored to have a toilet, which is a tempting upside Another all-time favorite is Smithsonian Butte Rd. It’s a bit of a secret local spot, so I don’t want to give much away online. If you’re tenacious enough to ask around and obtain the details, then you deserve to enjoy this spot. I’ll give you a hint: “Grafton”. Now that you have a general idea of how and where to camp on your next trip to Zion, all that is left to do is book your next vacation. The views from the vistas and mesas in the Zion National Park area are astounding and unmatched. Southern Utah offers some of the best camping views in the world and some of us are fortunate enough to call this place “home”. We welcome you with open arms! Be sure to stop in at the Springdale Visitors Center when you arrive for the latest information on weather and road conditions and don’t forget to grab some roadie tacos from Barefoot Taqueria adjacent to the Visitor’s Center. Until next time, fellow adventurers. Safe travels and always strive to escape the ordinary! I found your web site from Google and I have to state it was a fantastic locate.